In previous post, discussed about to delete a node from Binary Search Tree. 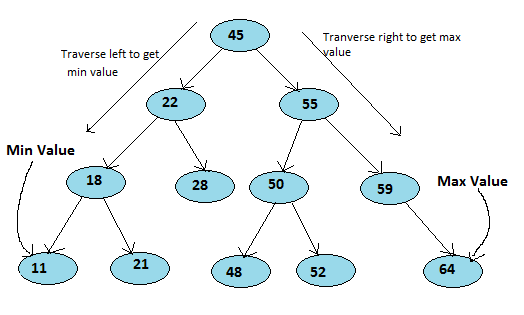 In this post, we will see how to find the max and min value of binary search tree. Keep in mind :-- In a BST, the data of all the nodes in the left sub-tree of the root node should be less than or equals to the data of the root and the data of all the nodes in the right sub tree of the root node should be greater than the data of the root. In this program, to find the min value just you can traverse a node to left to the end, Same thing for the max value also. Traverse a node to right to the end.